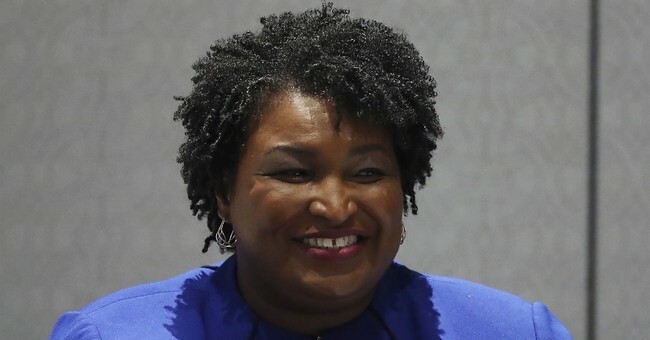 Failed gubernatorial candidate Stacey Abrams prepared the Democrats' response to President Trump's State of the Union address. Going into it, none of us really knew what to expect but honestly, the bar wasn't set too high. Abrams never conceded to Brian Kemp and she's continually pushed the idea that "voter suppression" (not the people's voice) is what kept her from winning her bid for governor of Georgia. Although the Democrats might not have known exactly what President Trump was going to address on Tuesday night, whoever wrote her speech cast a really, really wide net. She mentioned issues Trump didn't even touch on, like gun control and climate change. Not only that, but the response was focused on Abrams personal story. And while she tried to use her own anecdotal experiences to deliver a message, it came off as selfish and rather narcissistic. Is this her way of hinting that Americans should always help others? Specifically, is she referring to Democrats' desire to help illegal aliens? What's so wrong with Americans standing up and deciding that we must help our own people before we help other nations. We're so busy fighting everyone's battles for them that we fail to address our own crises here at home, in America. President Trump has made it his personal mission to make sure we put America first. And there is absolutely nothing wrong with that. President Trump warned Democrats. He told them he wanted a border wall. It shouldn't come as a surprise. He campaigned on building a wall years ago. He specifically told Democrats last year, when he signed the budget, that next year he wanted border wall funding or a shutdown would happen. They called his bluff and guess who came out looking like the fool? The Dems. This wasn't a "stunt" that abandoned people. This was a promise he was fulfilling to the American people. Democrats are the ones who refused to compromise with him. He was willing to extend protections for DREAMers and what was Speaker Pelosi's response? "We won't give one dollar for the border wall." If you want to point the finger at anyone, look at madam speaker. Great. You had an accomplishment. What does this have to do with Trump's vision? Oh, right. Nothing. As a nation, we've agreed to educate our kids from kindergarten through 12th grade. Anything beyond that is up to the individual. Part of having the "equality of opportunity" aspect has to end somewhere. If we made sure every single person was walked through life, from education to career, we'd have people complaining that they were discriminated against if they became a plumber while their friend became a lawyer. People would still not be happy. At some point, we have to take responsibility for our future and make our own decisions. When the government has their hand in every single aspect of our lives, we're one step closer to living in a tyrannical society, the one thing our founding fathers worried about. She must be referring to GM's massive layoffs. She must not know that the company decided to restructure so they could free up capital for the future. Trump and various members of Congress tried to save those jobs to no avail. 1) No one is "caging children." As retired Border Patrol agent Hector Regalado told me, families are separated from the general population. If Border Patrol suspects the adult is pretending to be the child's parents, they seek greater intel. And guess what? This isn't new. It's something that happened under President Obama's leadership as well. 3) Trump didn't say immigrants aren't welcome. He said legal immigrants are welcome and we need to keep people from dangerously crossing the desert to come to America. We were also told we could keep our doctors and that our payments would go down. Remember those talking points? They're not the case for the majority of Americans. "Fair-minded judges" mean people who are progressive and share their ideals. Everyone else is tipping the scale. And when did Abrams accept the results? That's news in itself. Translation: It's okay for illegal aliens to vote in our elections as long as Democrat wins. If a Dem doesn't win then there's "voter suppression." Guess that means Disney characters should be allowed to vote too, right? Are you freaking kidding me? Democrats are still defending infanticide. Still. Harming women and families is bad but murdering babies is okay? Talk about sick, twisted logic. The Democrats say they don't want President Trump to fail but if he succeeds that means their policies are crap. That means they'd have to reevaluate their stance on positions they've clung to. And you know they don't want that.